St Aidan’s church was built as a Chapel of Ease for the village of Caythorpe in 1900. 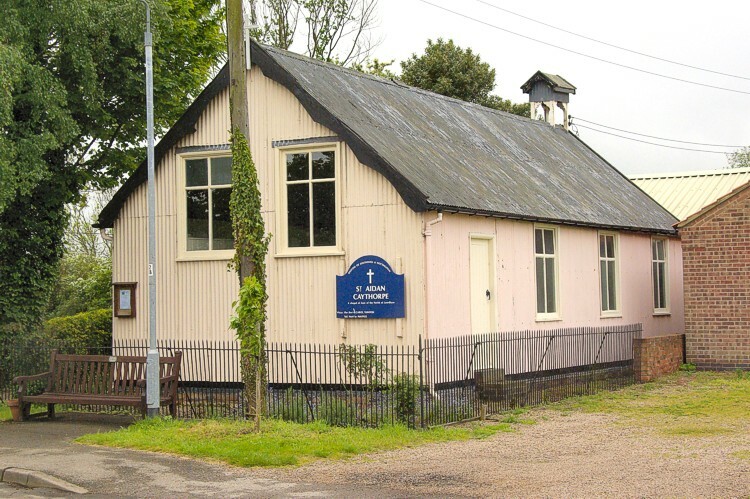 It is almost unique in that it is a Tin Tabernacle which is still being used for worship today. In some cases these chapels have been replaced by permanent buildings. Others have been relocated, or used for secular purposes. It is not known why the church was dedicated to St Aidan. Saint Aidan is believed to have been born about 600AD in Ireland. He went to Iona, became a monk and rose to the rank of Bishop. In 635 he was sent to convert Northumbria at the invitation of the local King Oswald who was a Christian. He set up a monastery on the Island of Lindisfarne in sight of King Oswald’s castle at Bamburgh. Possibly it was felt that the church in Caythorpe reflected Aidan’s simple style of mission and Christianity.